A practical blend of synthesis and modelling in an easy-to-use package that will greatly expand your sonic options. Ease of use. Ability to blend four voices. COSM guitar and amp simulation for conventional guitar tones. Altered tunings. No graphic editing software as yet. This is a welcome return to the GR range from Roland. There's a massive library of sounds onboard. You can import audio files and play them back using the GR-55's footswitches. The hex pickup is easily attached to your guitar of choice. The Guitar Out means that you can use separate amps for the guitar and synth sounds. 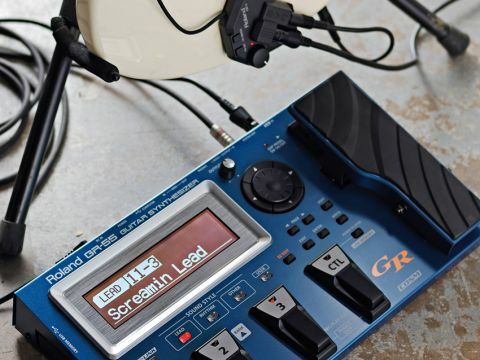 It's been some time since Roland released a new model in its GR guitar synth series - the now-discontinued GR-20, along with its associated GK-3, was released back in 2004. Since then, Roland has released the VG-99 Virtual Guitar system (also utilising the GK-3) and some of that Virtual Guitar technology has taken root in the all-new GR-55, where elements from both the GR and VG series are fused into a unit that delivers the sounds of virtual guitars, basses and amps, as well as the synth voices that have always been integral to the GR series. "Roland says tge GR-55 is far and away the fastest tracking guitar synth ever, and this is borne out when playing." The GR-55 features two independent PCM synthesiser sound engines, which are each loaded with over 900 sounds, including conventional instruments such as pianos, organs, strings and brass, plus vintage and modern synth sounds. A third sound engine is dedicated to Roland's COSM modelling technology and delivers emulations of acoustic and electric guitars and basses. All three sound engines can be combined, along with the normal guitar signal if desired and a bunch of effects, including COSM amps and effects, to create a massive range of composite sounds. A huge library of preset sounds in various categories are stored onboard ready for instant recall alongside user memory slots to program your own sounds. As with previous GR and VG series products, the GR-55 connects via the industry- standard 13-pin cable to Roland's GK-3 divided pickup hardware, which can be fixed temporarily or permanently on the guitar of your choice and can also take the signal from your guitar's jack output. There are two GR-55 versions, one with and one without a pickup, to cater for those who already have a guitar sporting a hexaphonic pickup. Two USB ports add versatility to the GR-55. One port is designed for computer connection, allowing the GR-55 to function as an audio/MIDI interface. With a DAW running on your computer you can record GR-55 sounds and also record MIDI data or play virtual synths and samplers from the guitar. The second port is for connecting a USB memory device facilitating real-time playback of WAV audio files stored on USB flash memory - audio playback being controlled hands-free from the GR-55's footswitches. The GR-55 has a metal construction that should withstand the rigours of stage use very well and has what seems like a massive display that is easily read, with the selected patch number and name in large script. Four switches and a pedal treadle provide foot control alongside a larger rotary wheel/four-way cursor set-up and numerous other buttons. "There are loads of adjustable parameters and consequently plenty of scope to create your own sounds." The first three footswitches are used for the selection of patches, which are stored in banks of three, letting you instantly switch between three different sounds for the active bank. To select a new bank you hold down the first two switches momentarily to enter a mode where switch one scrolls up through the banks and switch two scrolls down. Pressing either of the other switches loads the selected bank and then it's just a matter of stepping on switch one, two or three to select the patch you want. Alternatively, and quicker if your hands are free, a bank can be selected with the up/ down buttons on the GK-3 pickup's controller, then patches with buttons one, two or three. Patches can also be directly selected by using the rotary control to scroll through them in order. The patches are categorised as Lead, Rhythm, Other or User with 30 banks each for the first three categories and 99 User banks. A row of four buttons just above the footswitches lets you instantly select the category instead of scrolling through all of the banks to get there. The GR-55's default mode is for use with guitars, but if you want to use it with a bass you can switch modes in a menu. The GK3 pickup controller, as well as providing a volume control and bank selector, has a three-position switch that lets you choose the GK3 pickup, your own guitar pickups or a blend of both. If you select your own pickups, that signal (with or without COSM sound) is sent to a separate 'Guitar Out' output on the GR-55 so that you can use a different amp rather than the one handling the synth sounds. MIDI data can also be outputted from the GR-55 giving you access to any synth or sampler connected to it for even more sound options. All of the other GR-55 functions fit seamlessly into the picture, and the audio interface works fine once you've downloaded and installed the drivers from the Roland website. The Audio player gives you a useful source of music to practise with or use as backing tracks, and you can record 20 seconds of audio with the rudimentary looper and overdub as much as you like. There's a broad cross-section of sounds in the preset patches, from typical synth tones and new hybrid options utilising a blend of the sound engines, through emulations of conventional instruments (pianos, flutes and the like) to a range of modelled guitar and amp combinations. Roland has developed new pitch detection technology for the GR-55, which it says makes it far and away the fastest guitar synth ever. This is borne out when playing as the tracking is instant and reliable. Where with earlier guitar synths you may have had to adapt your playing to compensate and avoid glitches, this one is much more forgiving, although clean playing still helps, and adapting your technique is useful when playing some traditional instruments. The previously mentioned piano and flute will sound more realistic if you approach them like a pianist or flautist rather than a shredding maniac. That's if you want them to sound realistic of course - there are no rules with an instrument like this! "There's a broad cross-section of sounds in the preset patches, from typical synth tones to a range of modelled guitar and amp combinations." Played in the correct style, the conventional instruments do sound eerily authentic and it's quite possible, for instance, to pull off a great harmonica solo. For guitar sounds there are a number of familiar modelled guitars and amps, and the presets reflect this, giving you combinations such as Strat and Tweed or Les Paul and Stack. The VG technology also allows for altered tunings, so you can call up DADGAD and others instantly, and there's one really cool Feedback patch where sustained guitar notes consistently take off into a very natural-sounding octave feedback. Elsewhere, there are options to make your band sound bigger with instruments layered with guitars so you can, say, play guitar chords and have an organ follow it, and there's plenty of more esoteric and atmospheric stuff such as a 12-string with strings behind it. For each patch, the control switch on the pedal can be used to switch something on and off such as pitching the synth sound up an octave, turning on a delay effect or layering a 12-string with a six-string emulated acoustic. Likewise, the treadle can be assigned to control parameters, typically volume, wah or Whammy-style octave pitch shifts. The COSM modelled guitars can be treated with COSM amp simulation and modulation effects, as can your own guitar sound, making it perfectly possible to use the GR-55 as a 'normal' processor without any modelled or synth voices in the mix. There's a multi-effects processor for the two synth voices, or if desired for the entire patch, and on top of that there's global chorus, delay, reverb and EQ to add the final sheen to a patch. If you want to quickly edit a patch, there's an EZ Edit button, which gives you a simple four-sided grid instantly for tonal and ambient tweaks via the four-way cursor and access to the Patch Level, which is adjusted by the rotary wheel. For deeper editing and constructing your own sounds you need to hit the Edit button, bringing up pages you can scroll through. The first page - 'Tone' - shows you the elements the patch is made up from; the PCM1 PCM2 synth engines, the COSM engine and the normal pickup. Here you can choose which of these to use, mix them in proportion and choose the synth sounds for the PCM engines and the model for the COSM engine as well as tweak a host of their parameters. Another page lets you tweak effects while another sorts out pedal assignments and the like. There are absolutely loads of adjustable parameters and consequently plenty of scope for creating your own sounds. While the edit screen is easy enough to navigate, a computer-based graphic editor would be better, and Roland tells us that one is in the pipeline - at the moment there's only librarian software for the patches. Guitar synths have come a long way since Roland brought out the GR-500 in 1977 and the GR-55 has the broadest appeal of any of them, representing the current pinnacle in terms of both playability and the range of sounds that are available. The main difference between this and earlier GR units is the addition of COSM amp modelling, which not only adds an extra voice in the creation of completely new hybrid sounds, but also means that you get access to a wide range of conventional guitar and amp tones, too. If you're looking to expand the range of sounds that you can get from any guitar beyond all imagination, the GR-55 and a GK3 is the way to go. There's plenty of deep sonic tinkering available for those who want it, but for newcomers to guitar synths it's also dead easy to use straight out of the box. Mind blowing.